The global cold form blister packaging market has been gaining swift momentum due to growing investments in healthcare industry. The increasing number of medical facilities and launch of several health programs by the governments across the world has augmented the demand for cold form blister packaging. Cold form blister packaging is extensively used in pharmaceutical industry as it is convenient for delivering and dispensing various products. The growing food and packaging industry is also expected to give the global market tremendous boost. 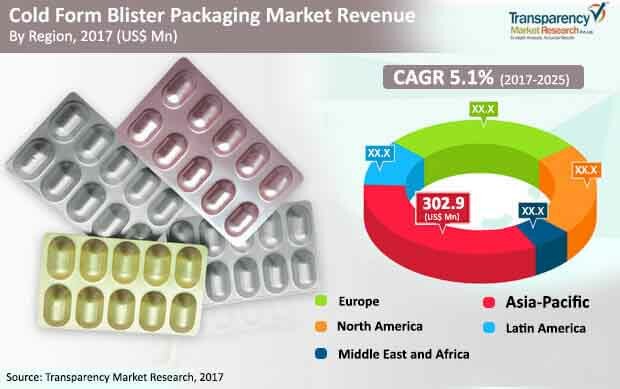 According to Transparency Market Research, the global cold form blister packaging market is likely to be worth US$1, 1437.7 mn by the end of 2025 from US$715.4 mn in 2016. During the forecast period of 2017 and 2025, the global cold form blister packaging in expected to surge at a CAGR of 5.1%. The polypropylene and other material such as PE, PET, etc. used for the production of cold form blister packaging to witness the highest growth across the globe. However, the aluminum material is estimated be the most prominent material type with a market volume share of 50.9% by the end of forecast period. The OPA material is used for the top layer and PVC material for the inside layer in the cold form blister foil. The PVC is the widely used material for the production of the thermoform blister foil. However, it also accounts for the major share in the cold form blister packaging market. The PVC material is expected to expand at a CAGR value of 5.0% during 2017-2025. By application type, the pharmaceutical segment dominates the market with the market value share of approximately 97.8% by the end of forecast period. The pharmaceutical segment is primary application area in the cold form blister packaging market due to the high usage of cold form blister for the packaging of the unit dose medicines such as tablets & capsules. The cold form blister packaging is also used for the packaging of various veterinary products and inhalants. It is also estimated that the demand for cold form blister packaging will grow at a good CAGR value for the Food & Confectionary and Other Industrial Application. However, the market share of these segment will not become more than 3% by the end of forecast period. The global market has been segmented into five regions, i.e. North America, Latin America, Europe, Asia Pacific region (APAC), and the Middle East and Africa (MEA). The Latin America region is projected to register the highest CAGR of 7.0%, over the forecast period. APAC region dominates the market and is estimated to represent the highest absolute opportunity of US$ 149.8 mn by the end of forecast period. However, the cold form blister packaging in the North America region is estimated to grow substantially by 220 basis points by the end of forecast period. The Europe region is estimated to account for second most prominent region in the cold form blister packaging market. Countries such as India and China in the Asia-Pacific region to have a major share of the global cold form blister packaging market due to high penetration of the pharmaceutical companies in the region. The high market share of these countries could also be attributed to the growing trends towards the high usage of cold form blister packs over the thermoform ones. The European countries such as Germany and France to account for major market volume share in the region. However, the demand for cold form blister packaging is expected to grow substantially in the North America due to changing trends towards use of blister packs over plastic or glass bottles for the pharmaceutical packaging. The MEA and Latin America also offer strong growth potential for the cold form blister packaging in the coming years. Key players in the global cold form blister packaging market include Amcor Limited, Bemis Company, Inc., Constantia Flexibles Group GmbH, Bilcare Limited, Winpak Ltd., Uflex Ltd., ACG Pharmapack Pvt Ltd, Svam Packaging Industries Pvt. Ltd., Tekni-Plex, Inc., Essentra plc, Ningbo Dragon Packaging Technology Co., Ltd., Rollprint Packaging Products, Inc., R-Pharm Germany GmbH, Wasdell Group, Shanghai Haishun New Pharmaceutical Packaging Ltd.
Transparency Market Research examines the global cold form blister packaging market for the forecast period 2017-2025. The primary objective of the report is to identify opportunities in the market and present updates as well as insights pertaining to various segments of the global cold form blister packaging market. The report begins with an overview of the global cold form blister packaging market, evaluating market performance in terms of revenue, followed by TMR’s analysis of key trends, drivers and restraints witnessed in the global cold form blister packaging market. Impact analysis of key growth drivers and restraints based on the weighted average model is also included in the report. To compute the market size, in-depth secondary research is done. Data points such as regional splits and market split by material type, by distribution network, by primary usage, and by region, have been assimilated to arrive at the market estimates. The report comprises the forecast of the global revenue generated by sales of cold form blister packaging market. TMR triangulates the data via different analysis based on supply side, demand side, as well as dynamics of cold form blister packaging market. Vital feature of this report is the analysis of the global cold form blister packaging market by material type, by application, and by region; and the corresponding revenue forecast in terms of absolute dollar opportunity. This is traditionally overlooked while forecasting the market. However, absolute dollar opportunity is critical in assessing the level of opportunity that a provider can look to achieve as well as to provide potential resources from sales perspective of the global cold form blister packaging market. To understand key segments in terms of their growth and performance in the cold form blister packaging market, Transparency Market Research has developed a market attractive index. The resulting index should help providers identify existing market opportunities in the global cold form blister packaging market. In the final section of the report, cold form blister packaging market competitive landscape has been included to provide a dashboard view of companies that manufacture and provide Cold form blister packaging services. The report contains company profiles of some of the players in the Cold form blister packaging market.